Place this paper plate in a microwave oven and dry roast on high power for 30 seconds. Stir once with a spoon and again microwave on high power for 30 seconds. Take these roasted ingredients in a mixie jar and add fresh pumpkin seeds & grind them to a fine paste by adding water. The paste should be very fine. Chop one medium sized onion and keep it aside. Heat a pan and add oil to it. When oil is hot add caraway seeds and fry. When the seeds splutter add chopped onion and fry till they turn transparent. Now add the onion-ginger-garlic paste and fry till dry. Add coriander powder, turmeric powder and red chilli powder. Fry all these spices nicely. Now the mixture appears too dry. Add little milk and stir. When the mixture is dry, again add some more milk and stir. Like this add all the milk little by little and stir. Now the gravy appears somewhat thick. Add water to balance the gravy. Now add the green peas and mix well. Also add the raisins and salt. Mix well and cook covered on slow flame for 3 minutes. After 3 minutes remove the lid and add Paneer pieces. Mix well and cook covered on slow flame for 2 minutes. After 2 minutes remove the lid and stir the curry. Now add the ground paste of Poppy seeds and mix well. After adding this paste the gravy slowly becomes thick. When the gravy is sufficiently thick stir and transfer it to a serving bowl. Serve garnished with chopped coriander. There are different ways to thicken the gravy. One way is to put cream and thicken it. Another way is to add a paste of cashew nuts. 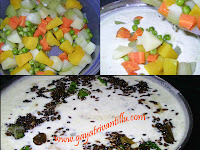 One more way is to add a paste of poppy seeds and coconut to thicken the gravy. Here in this recipe I have used soya chunks powder to thicken the gravy. Soya does not have any taste but is rich in proteins. With the neutral taste of soya it will fit well with any curry. 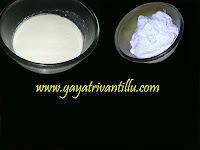 I have also added a tbsp of cashew nuts in the paste which will enhance the taste of the dish. One can use deep fried Paneer also in this dish. But for calorie conscious people it is better to avoid deep frying Paneer pieces. Here in this recipe I have used Paneer which is made from low fat milk. Though the dish appears rich, it is a healthy dish with low fat products and high protein soya. This dish can be eaten with Naan, Parathas, Phulkas, Fried Rice, Biriyanis or even with plain rice. gayatri garu mee vantalu chala baga unnai.maaku chala baga nachai.meeru vantala gurinchi chala baga explain chestunnaru.inka meeru ilage maaku vantalu gurinchi cheppandi. hi my name is janaki .i live in united states california .but i am originally from vizag .i really liked the recipes on your website .but thats not the main reason i am writing to you .i am writing because of the lifestyle changes section you had added .its really good what you did with your weight and the photos you added could not get get any simpler to give the message .